During the past few years, concrete grinding has advanced considerably and new technological innovations have made concrete grinding much more efficient. To achieve the results you desire, you must select the proper grinding machine and grinding bits that are suitable for your particular job. We will provide you with an overview on how to select the appropriate equipment for your needs. There are two different types of grinders currently available, floor models, and handheld models. Handheld grinders are lightweight and are used on walls, door seals, and other above ground areas. Since this type of grinder is handheld, you must control it manually in order to create a smooth surface, unlike floor models which are much heavier and require less manual control. The latest generation of handheld concrete grinders are fitted with type 28 saucer discs instead of type 27 flat discs and this allows the operator to exert more control over the job. In terms of size, floor grinders are naturally larger in size and also heavier than hand-held grinders and are normally used for resurfacing concrete floors. In comparison with the handheld units floor grinders are easier to control and can also cover larger areas in a relatively short span of time. These grinders also come with a variety of attachments making them suitable for many different kinds of concrete grinding jobs. 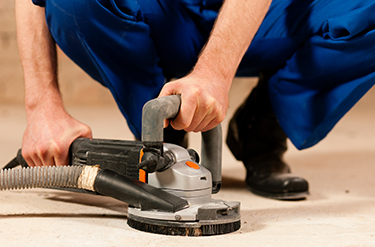 They may be used to totally resurface a concrete floor or to remove a coating that was previously applied to the floor surface. The two head floor grinder attachments currently available on the market are actually a combination of six grinding stones or cutter heads. Each of these heads rotates in opposite directions giving the operator improved control over the grinding process. The standard grinding stones are normally suitable for removing concrete surface of some types of coatings, but if the coating is gummy or thick it may plug up the stones. Concrete grinders with diamond cutters are also available. Diamond cutter are most costly but they last much longer than standard stone grinders and they are capable of grinding at a much faster rate than standard, stone head grinders. Another excellent available alternative are carbide concrete grinders. Carbide grinders are a better choice for heavy concrete coatings and they can perform with better efficiency on mastics, heavy paints, and gummy coatings. If you require a high speed concrete floor grinder, the it is best for you to use large size diamond discs. They are perfectly designed for faster performance and are normally used for the purpose of removing painted traffic lines or for completely grinding concrete surface. While grinding concrete, examine the condition of the concrete surface and select the right grinding tools and blades as explained above.